I dance around it all of the time. “Mayyyybe,” I’ll say with a twinge of hesitation. “Perhaps,” I’ll respond with uncertainty. “Let me check my schedule,” I’ll declare with ambiguity. I suppose it has something to do with the fact that I’m an avid people pleaser. The word “yes” clings to the tip of my tongue just as strongly as “please” and “thank you.” Because in my mind, “yes” is one of those basic manners you learn in grade school. It is the polite thing to do, and I’ll say it over and over and over again until I drive myself completely mad. But there’s a bit of deception in saying “yes” to everything because in doing so you are, by default, saying no to other things. This is something that I have had learn in the most unfortunate way; you see, it is often the case that I’ll find myself zipping out the door to meet this deadline or that commitment, all the while my family picks up the slack in my absence. Because by saying “yes” to everyone else, I am saying “no” to what matters most—my family. 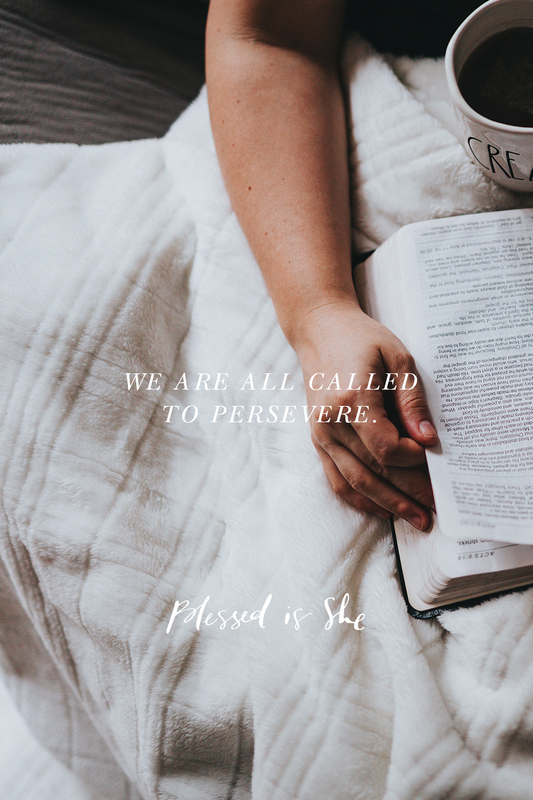 Today’s reading talks about perseverance, and I believe that there are certain things in life that we are all individually called to persevere at. For me, it is my vocation (my family) that I am continually trying to pursue, but it is also my family who suffers due to my drive to please everyone. One cannot serve two masters. There are certain things in life that we are all individually called to persevere at. And so, dear sisters, may we find the courage to say “yes” to those callings on our lives and “no” to the things that keep us from living them out. Yes!!! I love this. When I say “yes” to one thing, I am saying “no” to something else. Good perspective!! Needed this so much today….I am guilty of the too many yeses in my life, and the family is left stranded or holding the rope. Thank you for this. I shall pray for courage to say yes to my family more! Where do I find the reading for the day? I’ve subscribed an’ all, but am I missing something? The reading for the day is only on our site for the day, it goes away the next day!